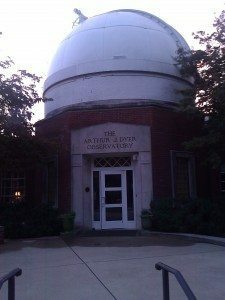 Dyer Observatory is part of Vanderbilt University in Nashville. It was built in 1953 after Arthur Dyer organized an in-kind services and material donation campaign with 80 firms contributing to the construction. There are no road signs that I could see telling you how to get there so you will want to make sure you take directions (or a GPS) with you. As you drive up the hill to the observatory, the trees close in and it feels totally isolated from the busy Nashville area, which is just want you want to be able to see stars at night without the interference from street lights, downtown spotlights among other light distractions. I knew I was there when I saw the big gates with the Vandy “V” on them. The fact there was nowhere else to go was also a give away. On our visit there was plenty of parking available. The parking is nicely situated at the top of the hill inside the grounds and walking to the main entrance could be accomplished using the paved roadway with little to no incline. There are no footpaths but then you don’t really need them on what is a private parking area purely for the Observatory. We attended as part of an organized Scout night, however the Observatory is open to the public (see below) for both daylight and nighttime events (reservations required). The Observatory is not large and is not stroller friendly if you intend to take little ones to the telescope. Be prepared to climb the stairs, but only a single flight. Other attractions do not require stairs, the entry display cases, the library and the bathrooms. The faculty offices are at the front of the building so you do have to navigate narrow corridors to reach the library which doubles as the presentation room. 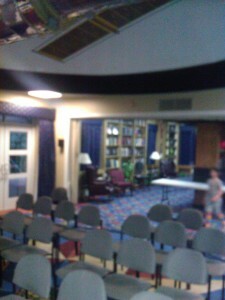 The bulk of the library books have been shipped to the main campus thereby allowing more people to read up on astronomy and create the seating area for the presentations. While the Scout event might be a little different from the public event, the staff was able to field all the questions. They were very friendly and great with kids especially when it was like herding cats at times. We were there for almost 2 hours. There was an initial presentation where the staff demonstrated to the kids the size of our planet in comparison to the sun, to the different planets in our solar system and the largest known star. It was quite an eye opener as to how small Earth actually is. An amazing tidbit we were told is about an incredible piece of software by Stellarium. It runs on a number of desktop platforms and provides a wonderful experience for looking at the stars with numerous options for highlighting all the constellations that I’ve never been able to pinpoint myself. Other than all the amazing features and knowledge sharing ability is the fact that it’s FREE. 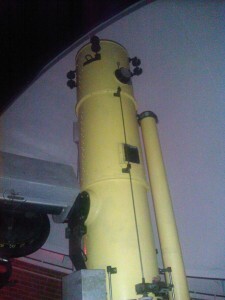 The telescope is the original one from 1953. The maximum magnification is 250x and the twin stars we saw were very clear albeit small and you could clearly see the color differences. A similar telescope was recently built with the same resolution and it cost $1.5million in today’s dollars. Everyone managed to get two turns to look through the telescope at two different star systems. The choices available at the time were limited because of the time of year. You may want to check out what is visible in advance. We did get to see an Iridium Flare just before sunset in addition to the above which was really pretty cool. It is visible to the naked eye from Nashville if you know when and where to look. It only lasts for a few seconds so you do need help from the Observatory staff for that. In case you were wondering an Iridium Flare is actually a satellite catching the suns rays and reflecting it downwards. From March through November the Observatory is open to the public the first Wednesday of the month 10:00am – 2:00pm. Nighttime viewing is the Second Friday of every month from March through November and Reservations are required. In addition to these times the Observatory holds other events so be sure to check their calendar. We found the experience well worth the trip and would recommend a visit even by daylight to talk to the astronomers on staff if a nighttime visit is not feasible. Hours: Daylight – The observatory is open to the public on the first Wednesday of the month March through November, 10:00 AM – 2:00 PM. No reservation is necessary for the first Wednesday open house. Telescope Nights – Second Friday of every month from March through November. $6.27 – purchase tickets online. Reservations are required. Start times vary so be sure to check the calendar.